Why do we serve coffee made from organic fair-trade, single origin coffee beans from Colombia, Ethiopia, Mexico and a range of exotic countries? Why not just stick to one or two countries and keep it simple? Because the unique origins of our coffee let us serve you a wider range of flavours. It’s totally fine to keep it simple and order up a “dark roast” or “medium roast” anytime. But taking a minute to recognize the different flavours of each country’s coffee can be fun and rewarding. Learn what you love so you can order your favorite coffee every time, or experiment with something new. What do you taste as you’re drinking your coffee right now? Can you name the flavour? It’s not always easy. There is as much variety in the taste of coffee as there is in wine; depending on where the beans are from, how they were grown, what kind of weather they grew under, how they were roasted and many other factors, that flavour in your coffee cup will be different. Is it fragrant like cardamom, giving off hints of roasted hazelnut or does it remind you of blackberries? 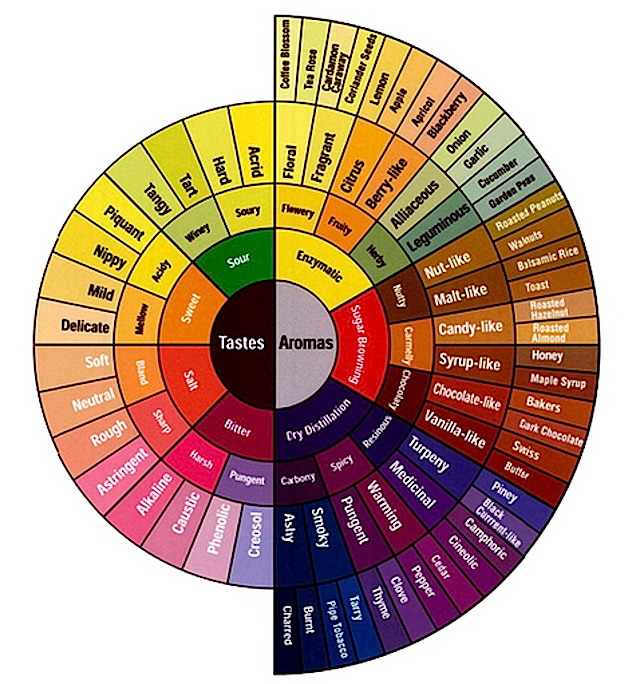 That’s why the Coffee Flavour Wheel was invented by the Specialty Coffee Association of America in 1995. It was around that time that coffee really started to be rediscovered in North America, transforming from a rather boring commodity you bought by the generic white styrofoam cupful back into the exotic, full-bodied beverage that put the zing back into our lives. More and more coffee aficionados (and to be fair, not a small number of café owners) were looking for a unified language to describe the differences they were tasting in every cup. Sour, sweet, salt and bitter. Enzymatic, sugar browning, and dry distillation. Now things start to get pretty interesting. You say our Guatemalan roast tastes “sour” – but in a good way? Acrid, but also spicy? Interesting… but let’s look at a coffee that’s even more complex. Oh, you got the dark roast from Ethiopian Sidamo and you’re telling me it’s “chocolaty”. Well, let’s dig deeper: like baker’s chocolate, or dark chocolate? And what else? You say it’s got a floral aroma – would you say it’s like a coffee blossom or a tea rose? Or did you really mean “fragrant” – in which case, is it like cardamom, caraway or more like coriander seeds? Next time you drop into one of our cafes in Vancouver or Richmond, pop this Coffee Flavour Wheel onto your tablet or smartphone screen – but don’t look at it right away. Take a few minutes and see if you can identify the different tastes and sensations that your coffee is giving off. Make a mental note of your answers, or tell a friend. Next, compare what you experienced to what you see on the Coffee Flavour Wheel – and see if what you described fits your taste. There’s really no wrong answer, since everyone’s palette is a little different. The point isn’t to be “correct” but to be able to place the taste of the coffee with its origin. Remember, all of our coffees are 100% organic and roasted in small batches at our Granville Street Roasting House, so that taste you’re experiencing is all natural. Enjoy!